Consistent, easily accessible management tools are key to maintaining a healthy hybrid environment – the challenge is doing so without breaking the bank or relinquishing security standards. That’s where the collaboration between IBM Cloud and VMware comes in to play. 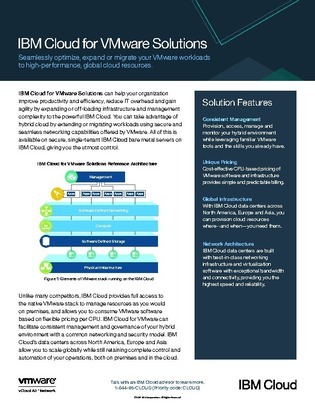 Open this brief whitepaper to learn how IBM Cloud can seamlessly migrate existing VMware workloads, giving them access to high performance and globally accessible cloud resources. Plus, discover how this platform provides the same VMware stack management capabilities that on-premise provides, and then some.